This is the first of six reviews I’m doing thanks to FPN member “Alecgold.” In December of last year, he decided to give away the majority of his fountain pen ink collection to people willing to review them on FPN. I offered, he accepted, and he sent me 6 bottles of ink. I got the box in February 2011, but I was unable to do the reviews until now, so here we go. The Parker Penman line of inks has long since been discontinued. It was one of the first ink lines to develop and distribute highly saturated inks. There were, unfortunately, a few issues with the inks. When they were allowed to dry in a pen they created nasty clogs and strained everything. Apparently, the water component of the inks was more apt to evaporate leaving behind the concentrated dyes. Enough pens were clogged/stained that Parker decided to discontinue the line rather than continue to pay for the repairs or reformulate the inks. As the years have gone by, the Penman inks have become the stuff of legends. They are highly coveted and, although they do come on the market from time to time, they are very pricey. This is especially true for the most sought after Penman ink, Sapphire. When Alec offered to send me a Penman ink I was enthralled. I’d always wanted to try the ink, but I was never able to get a bottle. This was not for want of trying. I was just always a day late and a dollar short so to speak. As a matter of fact, I’d still very much like to try some of the other Penman inks (especially Emerald and Sapphire). Hopefully I can someday. 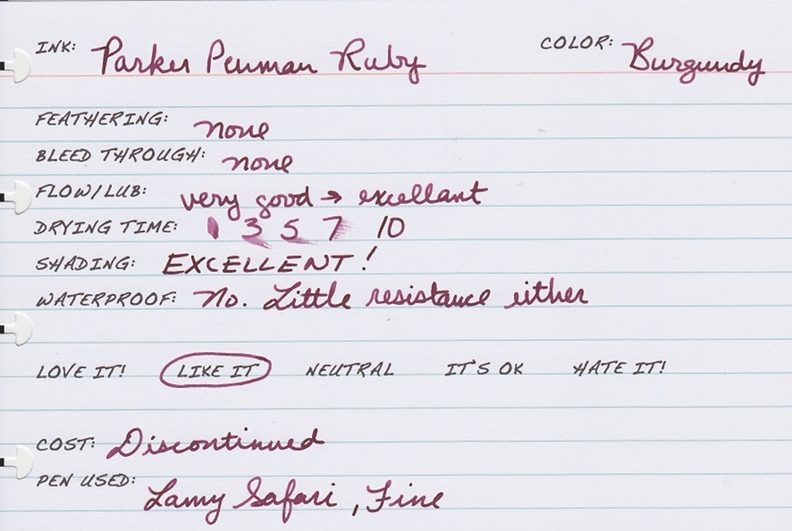 The color of Penman Ruby is only marginally similar to that of the gem. It comes off as a burgundy color more than anything else. It is very appealing to my eye. If you are wanting a current production ink that is similar to Penman Ruby, the closest I’ve seen is Diamine Syrah (another excellent ink). The shading is PHENOMENAL! Apart of the color, this is the most appealing characteristic is of the ink for me. Unfortunately, it is not water-resistant. Although this ink is highly saturated, it is no more so than some of our current production ink lines like Private Reserve and Noodler’s Ink. Alec review 1/6. No Affil. ← Fountain Pen Network LE 2011. Which one should I get?